Clumping litter simplifies the task of cleaning out the cat’s box. Are you wondering what they put in some brands of kitty litter to make it clump? And whether the stuff acts like cement in your cat’s gut if he licks his paws after taking care of business? Get the scoop on clumping agents and make an informed purchase the next time you need to freshen your cat box. Sodium bentonite is a clay that contains the volcanic ash montmorillonite. It has the ability to absorb and retain large amounts of liquids including cat urine. Bentonite has the added benefit of being an all-natural odor absorbent, which helps to keep your home from smelling like cat pee. According to the Texas Sodium Bentonite Inc. website, this clay has more than two dozen other uses including pond sealant, wastewater treatment, dust control, ceramics, wine making and colon cleansing. How do you feel about using portable potties or gas station restrooms? That’s about how most cats feel when faced with using a litter box that is past due. Some cats take their business elsewhere, like under your bed or in the back of your closet, rather than use a dirty box. Clumping litter allows cat waste to be easily removed from the box, so you will be more likely to clean it often, which will make your cat very happy. Your house will smell better, too. Automatic litter boxes are even more convenient, and they use clumping litter almost exclusively. Many cat and dog owners are concerned that their pet may suffer bowel obstructions if they lick kitty litter off their paws or eat from the cat box -- yeah, gross, but that’s what some dogs do. There have even been some concerns that clumping litter is toxic or can cause allergies. While there have been no scientific studies to validate these concerns, it is plausible to believe that if your pet ate enough of the clumping clay, he could get very sick; after all, litter boxes are full of nasty stuff. It is also easy to believe that litter can trigger allergy attacks since it is dusty and full of bacteria and germs. 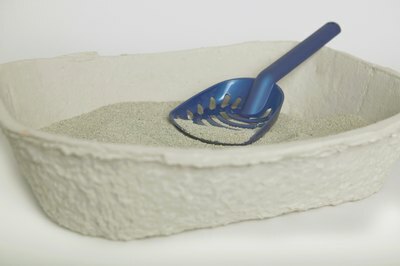 The good news is sodium bentonite clay is nontoxic, and your pet would have to eat an awful lot of the stuff to become seriously ill.
Because kittens are more susceptible to illness and more likely to eat from litter boxes, you may want to use other types of litter until your kitten is at least 4 months old. If your cat is prone to respiratory problems, use open litter trays to reduce the amount of dust your cat inhales during potty breaks. You may wish to use a dust mask yourself when changing out the litter box. If you have a wacky dog that eats cat poo, put the litter box in an area he can’t get to. Place a mat near the kitty litter box to reduce the amount of litter your cat will track away. Finally, pay attention to your cat’s behavior because he cannot tell you if there is a problem; he can only show you.